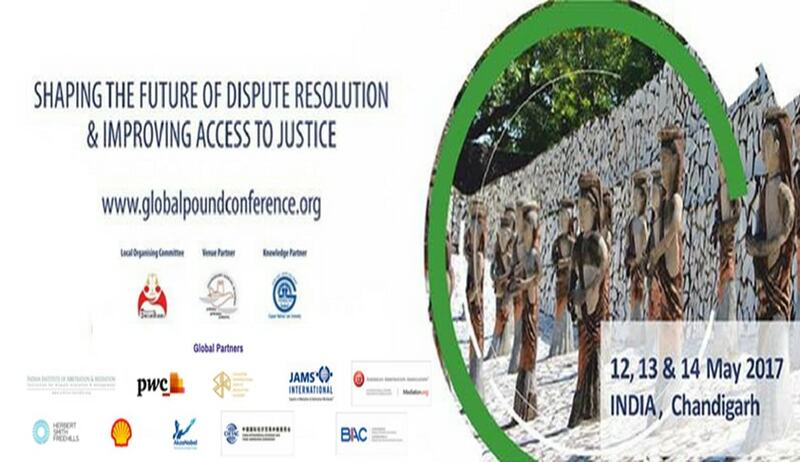 World’s largest ADR Conference, Global Pound Conference, titled ‘Shaping the Future of Dispute Resolution and Improving Access to Justice’ will be held at the Judicial Academy, Chandigarh, India on the 12-14 May 2017. Launched in March 2016 at Singapore and the last of the series to be held at London in July 2017, the GPC Series will be held in over 40 places organized in over 30 countries. The goal of the GPC series is to create a conversation about what can be done to improve access to justice and the quality of justice around the world in civil and commercial conflicts. The idea is to convene all stakeholders in dispute resolution – commercial parties, chambers of commerce, lawyers, academics, judges, arbitrators, mediators, policy makers, government officials, and others – at conferences around the world and discuss about the existing tools and techniques, stimulate new ideas and generate actionable data on what corporate and individual dispute resolution users actually need and want, both locally and globally. GPC India is co-organized by the Punjab and Haryana High Court, Mediation Cell Chandigarh and the Judicial Academy Chandigarh in collaboration with the International Mediation Institute, The Hague and the Indian Institute of Arbitration & Mediation. The local organising committee of the Global Pound Conference India comprises of Ms. Varuna Bhandari Gugnani, Mr. Anil Xavier, Mr. Atul Lakhanpal and Mr. Anuroop Omkar. The Global Pound Conference (GPC) series presents a unique opportunity to engage all key stakeholders in a conversation about dispute resolution and how it should be used in commercial and civil conflicts in the 21st Century. It will give participants enormous opportunity to interact and discuss. The participants like lawyers, arbitrators and mediators will get a chance to explore Indian options in the large business and commercial market of India.